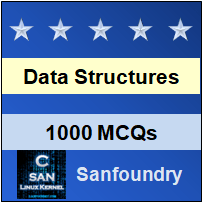 This set of Data Structures & Algorithms Multiple Choice Questions & Answers (MCQs) focuses on “Leftlist Heap”. 1. Pointer manipulation is generally more time-consuming than multiplication and division. Explanation: Use of pointers for merging reduces the speed of other operations. This is the main drawback of all advanced data structures. 2. How many properties does a leftist heap support? Explanation: A leftist heap supports two properties- structural property, ordering property and a heap order property. 3. In a leftist heap, the null path length of a null node is defined as? Explanation: In a leftist heap tree, the null path length of a null node with no children is defined as -1. 4. How many nodes does a leftist tree with r nodes must have? Explanation: A leftist tree with r nodes on the right path is proved to have at least 2r-1 nodes. This theorem is proved by induction. 5. Which of the following operations does not destroy the leftist heap property? Explanation: Performing insert and merge operations on the right path could destroy the leftist heap property. It is extremely easy to restore that property. 6. What is the fundamental operation on leftist heap? Explanation: The fundamental operations on leftist heaps is merge. Insertion operation is a merge of a one-node heap with a larger heap. 7. A leftist heap is also said to be a binary heap. Explanation: A leftist heap has a structural property and an ordering property which is similar to that of a binary heap. Hence, leftist heap is also said to be binary heap. 8. What is the efficiency of merge used in leftist heaps? Explanation: The efficiency of merge operations in leftist heap is mathematically found to be O( log N) which is the same in binary heaps. 9. What is the node path length of a node with 0 or 1 child? Explanation: The length of the shortest path from a node to a node without two children is defined as 0. 10. Why is this heap named leftist heap? Explanation: The heap is named as leftist heap because it tends to have deep left paths. It follows that the right path ought to be short. 11. In a leftist heap, all the operations should be performed on? Explanation: All the operations are performed on the right path because right paths are short. However, insertion and merges cannot be performed on the right path. 12. What would be the result if the left subtree of the root has a null path length of 1 and the right subtree has a null path length of 2? Explanation: When two leftist heaps are merged, if the left subtree of the root has a null path length of 1 and the right subtree has a null path length of 2, leftist property is violated at the root. 13. What happens if the null path length is not updated? Explanation: While performing insertion via merge operation in a leftist heap, if the null path length is not updated, all null path lengths will be 0. 14. What is the time taken to delete a minimum element in a leftist heap? Explanation: The time taken to delete a minimum element in a leftist heap is mathematically found to be O(log N). 15. In what time can a leftist heap be built? Explanation: The mathematical calculation yields a result that, a leftist heap can be built in O(N) time by building a binary heap.